Senior leadership has proved to be crucial for Estacada this season, and Friday's play-in game with Scappoose was no different. Ranger senior Brandon Thornhill was 2 for 4 with two RBIs — including the go-ahead RBI in the top of the fifth — and Wyatt Riedel threw a complete game on the hill as Estacada defeated Scappoose 5-4 at Scappoose High School to win a spot in the first round of the Class 4A state playoffs. While the 12th-ranked Indians saw their season come to an end with a 15-12 record, the No. 22 Rangers went on to drop a 1-0 decision to No. 3 La Grande on Wednesday to end their season at 13-12. The Indians previously finished third in the Cowapa League, while Estacada plaved fourth in the Tri-Valley League. "When all the seniors got together last night, we talked about how much we wanted this and we came out here and showed it," Thornhill said. Estacada was able to manufacture runs in the first and second innings to take an early 2-0 lead. Kayden Settle led off the game with a single to right field, took second on a groundout, stole third base and scored when Jared Weaver came through with a infield single to get the Rangers on the board. Mateo Burgos started the threat for Estacada in the top of the second with a one-out single to right field, and stole second and third. Then, after a walk to Dan Hunt, Scappoose starter Logan Travis looked like he was going to get out of trouble when Thornhill hit a hard ground ball to shortstop for what could have been a tailor-made 6-4-3 double play. 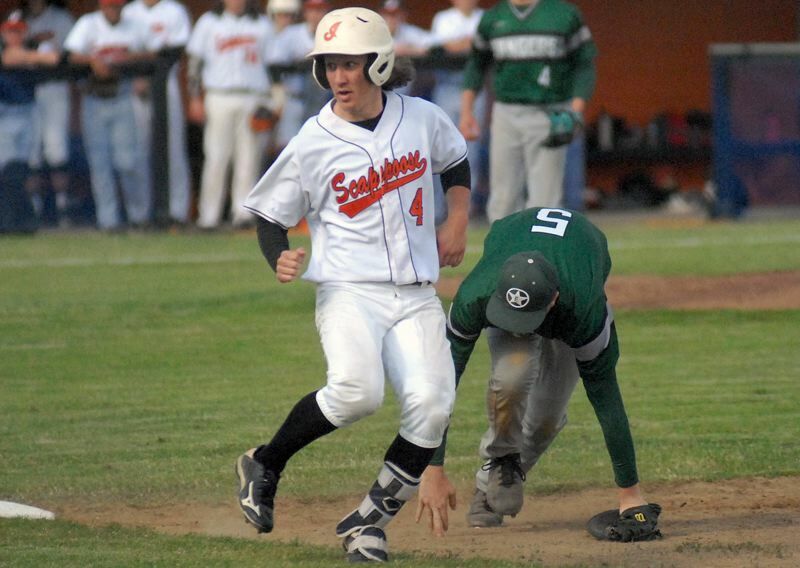 But Scappoose second baseman Jordan Buchanan dropped the throw from shortstop J.C. Gross while trying to make a quick transition, Burgos scored on the error and Estacada took a 2-0 lead. However, the Indians responded in the bottom of the frame, getting a two-out single up the middle from Quincey Cleveland and Terrence Lewis followed by driving a Riedel fastball well out of the park for a two-run homer. "I knew it was a blast when I hit it," Lewis said. "I felt like that got our team back in the game." But the Indians weren't done yet. After Ben Anicker drew a walk, Jerad Toman reached on an error by Burgos at shortstop and Gross made the Rangers pay with a two-run single to left field, putting Scappoose up 4-2. While the Indians had a two-run cushion, it became apparent that Travis began to lose his command in the top of the fourth. "I just got a little tired and lost my confidence," Travis said. "That's really all it was." Back-to-back singles by Thornhill and Settle got the Rangers in business with one out in the fourth. After issuing a free pass to Nick Keller, Travis was up 0-2 against Riedel, but hit him in the back with a breaking ball to bring in Thornhill from third. "He's a sophomore in a pressure situation. Playoff baseball is just a little bit different," Scappoose coach Mike Reed said. "Logan had a couple pitches get away from him in some big moments." With the bases still loaded, Weaver came to the dish and popped up to shallow right field. Buchanan got under the ball to make the catch, but was unprepared when Settle tagged up on a ball that barely got to the outfield. Buchanan's throw to the plate was wide and Settle's gamble paid off as the Rangers tied the game at 4-4. One of the things Estacada hangs their hat on is aggressive base running and that mentality really paid off for them in this one. The Rangers stole five bases on the day and were able to take extra bases on multiple occasions. "Once we get a guy to first, we're looking to run bases smart and to the best of our ability. It's something we have preached since day one," Estacada coach Andrew Higgins said. "We were able to put a lot of pressure on (Scappoose) today." Estacada then took the lead in the top of the fifth. Thornhill drove an RBI single to left field off of Gross — who replaced Travis on the mound — bringing in Burgos to score and giving Estacada a 5-4 advantage. Once the Rangers retook the lead, Riedel knew that he had to deliver from that point forward. "We could all sense that the moment was getting closer," Riedel said. "I just needed to keep calm and keep doing my thing and I knew that my teammates would pick me up." After the debacle in the second inning, Riedel recorded nine straight outs and was pitching with great rhythm. Scappoose got a runner in scoring position in the bottom of the sixth, but consecutive strikeouts from the senior right-hander got the Rangers out of the jam. Toman got the Indians' first hit since the second inning in the bottom of the seventh with a two-out infield single that brought the winning run to the plate, but Riedel got Gross to on a fly to Thornhill in left field to end the game. "(Riedel) did an excellent job. He was the difference in the game," Reed said.